Home » AEON » purchase » qna » spend » Visa » vouchers » Visa Spend & Win Contest @ AEON: Prizes Up to RM100,000 to be won! 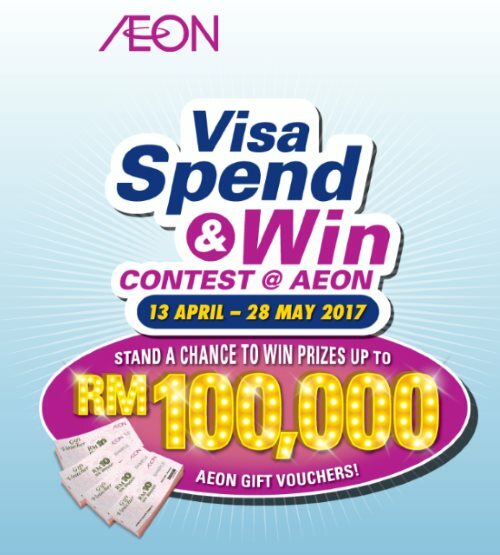 Visa Spend & Win Contest @ AEON: Prizes Up to RM100,000 to be won! Spend and pay RM150 and above (with Visa card) OR RM50 and above (with Visa payWave card) at any of AEON Stores, AEON MaxValu and AEON Wellness Shop only to participate in the contest. The completed Contest form shall be submitted together with the original purchase receipt (a single or maximum combination of two receipts) at the AEON Customer Service Counter. Visit Visa Spend & Win Contest @ AEON contest page for more details. DON'T MISS OUT: RM7.99 The Manhattan FISH MARKET offer is back!